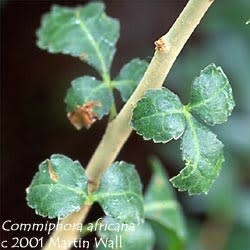 The genus name Commiphora derives from the Greek kommi, "gum," and phoros, "carrier." The species name and common name derive from the Arabic mur, "bitter." Myrrh is native to northeastern Africa, where it grows as a large shrub or small tree in harsh desert conditions, with hot sun and little water. The plant's leaves are obovate. The branches are spiny, and a pale yellow oil exudes from the tree when its dull gray bark is cut. Myrrh increases the motility of white blood cells and normalizes mucous membrane activity, which helps the body fight infection. It also promotes tissue granulation and combats blood stagnation. It is used in the treatment of amenorrhea, arthritis, asthma, bronchitis, candida, catarrh, coughs, dental problems, dysentery, dysmenorrhea, impetigo, laryngitis, pharyngitis, rheumatoid arthritis, sinusitis, sore throat, staph infection, tonsillitis, uterine tumors, and yeast infection. Topically, myrrh can be made into a salve to treat acne, boils, impetigo, infected wounds, sores (especially those caused by pressure from prosthetic limbs), and staph infection or a liniment to treat boils, bruises, and pain. As a chest rub it helps combat respiratory infections. It is a premier herb for dental problems and can be prepared as a tooth powder, paste, or tincture to combat cavities, gingivitis, pyorrhea, and toothache. It also can be prepared as a mouthwash to treat halitosis, tonsillitis, mouth sores, and thrush. Myrrh is not generally considered edible. It was used as a wine preservative in ancient times and is still used today to make the Italian alcoholic beverage Fernet Branca. Myrrh is famous as one of the gifts of the Magi to the infant Christ, along with frankincense and gold. Incense from ancient Egypt, known as kyphi, contained myrrh and is said to have been used by Moses in making holy oil to anoint priests. Burning myrrh is used to enhance meditation, dispel negative energy, elevate vibrations, heal emotional wounds, sanctify objects such as holy books, amulets and bibles. Myrrh is commonly used in perfumery and is also burned as incense, in which it repels mosquitoes and is said to promote peace, enhance meditation, dispel negative energy, and heal emotional wounds. Use myrrh internally only in small amounts and only for short periods of time, as the resins can be difficult for the body to eliminate. Avoid during pregnancy, as myrrh can stimulate the uterus. Large amounts can be overly laxative.